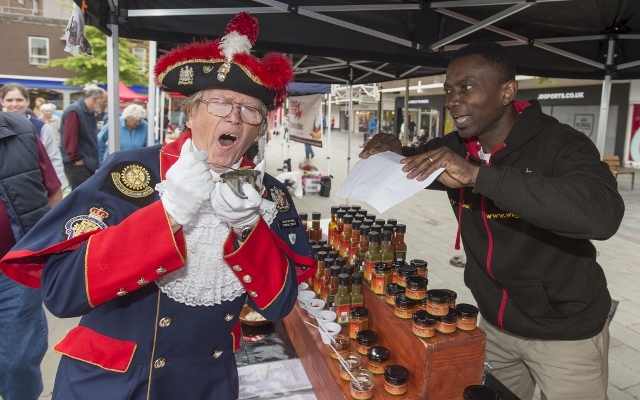 Town Crier, Barry McQueen tries to handle the heat. A chilli festival and an antiques and collectors fair proved to be a hot success when they make their debut appearance in St Helens town centre last weekend. As part of the first St Helens Chilli Village Fiesta, residents were able to experience a taste of South America in Church Square as chilli producers from around the country exhibited products such as mild to titan slaying extreme chilli sauces, naga cooking sauces, naga dips, chilli pickles, chilli plants, chilli cheese and chilli jam – on what was a day of pure chilli mayhem. 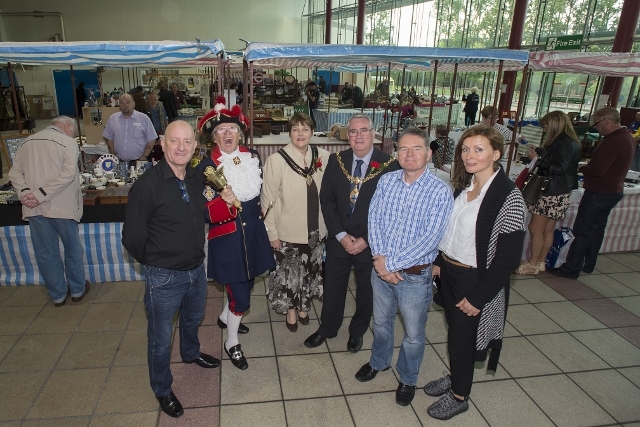 Meanwhile, over in St Mary’s Market that day, the Mayor and Mayoress of St Helens, Councillors Dave and Jeanette banks were guests of honour at the launch a monthly antiques and collectors fair. Taking place at the back of the market by the events space on the last Saturday of every month, shoppers can take a trip down memory lane and enjoy a day of nostalgia by viewing and purchasing vintage and retro items from yesteryear, including toys, comics, vinyl records, clothing and Americana. St Helens Town Centre Manager, Gary Maddock said: “It was great to stage the first St Helens Chilli Village Fiesta and based on the large attendance to the event we will be working with the event organiser to develop the event to make it even bigger next year! The events programme continues this Saturday (1 October) when dance groups from around the country jig their way into town as they join St Helens based Morris dancing group, Mucky Mountains Morris, for a day of dance. Taking place in Church Square and the World of glass museum between 10.30am and 4.00pm, visitors can look forward to performances from groups from across Lancashire and Yorkshire – as well as Appalachian dancing – a lively tradition from the states. Then on Saturday 22 October, prepare to be amazed when Titan the Robot returns to St Helens. The 8ft mechanical world-renowned star, who has featured on shows such as the X-Factor will treat large crowds to three free performances at 11:00am, 1:00pm and 3:00pm in Church Square. Titan’s unique blend of comedy, street theatre and music has made him a star attraction at high profile events throughout the world and he’s worked alongside superstars including Rihanna, Will Smith and Jackie Chan. Ahead of Halloween later next month, families are invited to attend a Spooky Welly Walk around Sherdley Park on Saturday 29 October. Organised by The Roy Castle Lung Cancer Foundation, the event is targeted at families from across the North West who are encouraged to take part in a one and a half mile walk with a number of Trick or Treat Stations along the way. St Helens town centre provides a great range of high street stores and independent shops, quality restaurants, pubs and bars. Easily accessible car parking can be found at Chalon Way Car Park and throughout the town centre. For more information about what’s happening in St Helens, please call 01744 676740. For regular event updates go to facebook.com/whatsoninsthelens and ‘like’ our page or follow us on twitter – @whatsonsthelens. The Mayor and Mayoress of St Helens, Councillors Dave and Jeanette Banks (centre) with Town Crier, Barry McQueen (second left) organisers Larry Murphy (end left), Frank McBride (second in on right) and Valantina McBride.